Based on analyses of satellite images, the Buenos Aires VAAC reported that on 24 February a diffuse plume possibly containing ash from the Cordón Caulle rift zone, part of the Puyehue-Cordón Caulle volcanic complex, was lifted from the surface by the wind. The rift zone eruption that began at Puyehue-Cordón Caulle on 4 June 2011 (BGVN 37:03) persisted through early 2012 and declined toward the end of 2012. Relative quiescence was observed through October 2013, which is the end of this reporting period. The Observatorio Volcanológico de Los Andes del Sur-Servicio Nacional de Geología y Minería (OVDAS-SERNAGEOMIN) maintained Red Alert (the highest level in a four-color scale) from 4 June 2011 to 23 March 2012; declining activity led to a downgrade in the Alert Level on 23 March 2012 to Orange, and then again on 24 April to Yellow. The status remained at Yellow until 16 August 2012, when it decreased to Green. Green Alert was maintained through the end of this reporting period of October 2013. Early stages of the eruption captured by remote sensing. Based on polar-orbiting satellites, scientists at the Montreal Volcanic Ash Advisory Centre (VAAC) were able to detect the volcanic ash cloud as it circled the southern hemisphere. 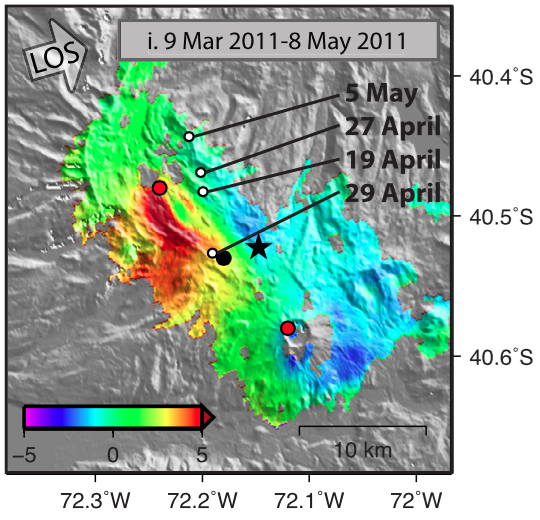 Using a combination of infrared channels, five satellites contributed to a mosaic of data showing the wide dispersion of volcanic ash over the period of 4-6 June 2011 (figure 8). A mosaic created on 14 June 2011 captured the 4 June 2011 ash as it approached the Chilean coast while, at the same time, a new ash eruption was occurring at Puyehue-Cordón Caulle (figure 9). Figure 8. Composite image of volcanic ash from Puyehue-Cordón Caulle as detected by satellites between 1937 on 4 June and 1551 on 6 June 2011. The 4-km resolution data was collected during 30 passes (satellites NOAA 15, 16, 18, 19, and MetOp-A) using a combination of infrared channels. The colors correspond to values of brightness temperature differences (i.e. ch4 - ch5) ranging from -0.5° C to -12° C. The image was produced at Montreal VAAC with the Terascan software and the NOAA CLASS data. Courtesy of René Servranckx, Meteorological Service of Canada. Figure 9. (A) Composite image from NOAA satellites NOAA-19 and NOAA-18 capturing two different stages of ash plumes from Puyehue-Cordón Caulle. The large plume over the Pacific Ocean was generated by explosive activity on 4 June 2011 and circled the southern hemisphere within 10 days. At 1938 on 14 June 2011, a new ash plume was erupting, contributing additional ash in the atmosphere. (B) Five satellites contributed to this image of Cordón Caulle's ash plume during 14-16 June 2011. With 4 km resolution, the image comprises 56 satellite passes using a combination of infrared channels. The color coding corresponds to values in the range of -1.5° C to -10.0° C. Both images were produced at Montreal VAAC with Terascan software and data retrieved from the NOAA CLASS website. Courtesy of René Servranckx, Meteorological Service of Canada. Post-processing of satellite images from GOES-13 highlighted the strong thermal anomalies that occurred during the early stages of the eruption. Daniel Lindsey of NOAA prepared a video sequence of images during 12-14 June 2011 that provided a clear way to identify the ash plume extending across Chile and Argentina (figure 10). From those images, it was possible to infer that a significant amount of ash was released from this eruption based on the persistent cold infrared brightness temperatures. Figure 10. Images of GOES-13 data show the extent of elevated cold infrared brightness temperatures and the ash plume from Puyehue-Cordón Caulle at four different times: 12 June 2011 at 1139, 12 June at 1309, 13 June 2011 at 0639, and 13 June at 1439; all times given in UTC. The purple color in these infrared layers corresponds to approximately -40 to -50°C. The location of Cordón Caulle is marked with a red triangle. Courtesy of Daniel Lindsey of NOAA/NESDIS/STAR/RAMM Branch. Based on webcamera observations, OVDAS-SERNAGEOMIN reported that incandescence was visible during 23 February-30 April 2012 and, at times, the local webcam views captured incandescence reaching up to 600 m above the rim (table 2). Table 2. 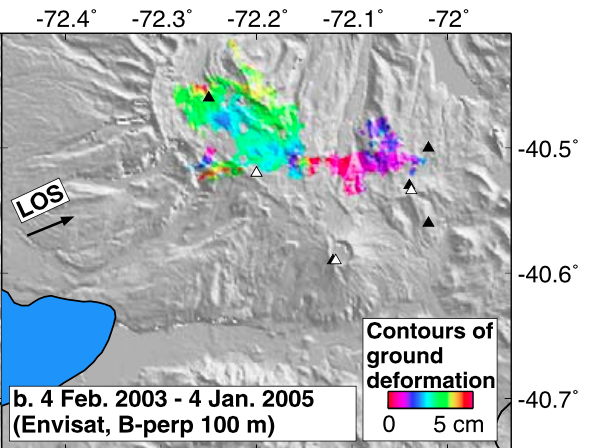 Seismicity and observations of Cordón Caulle's eruption during 2012 were documented in regular reports from OVDAS- SERNAGEOMIN. This table highlights data from 23 February to 22 April. Note that incandescence and plume heights correspond to km above the crater. Courtesy of SERNAGEOMIN-OVDAS. Based on seismicity and visual observations, declining activity was noted from late April 2012 through October 2013 (table 3). Incandescence and plumes from the crater were rarely documented, partly due to poor weather conditions. Seismicity was reported in terms of individual counts and, after the Alert Level was downgraded to Green, seismicity rarely exceeded 20 events per month. Table 3. Activity at Puyehue-Cordón Caullefrom 24 April 2012 to 31 October 2013. Earthquake types, volcano-tectonic and long-period are abbreviated with VT and LP, respectively. MD refers to magnitudes calculated from signal duration; RD is the abbreviation for reduced duration. Courtesy of SERNAGEOMIN-OVDAS. Although activity had diminished significantly by April 2012, field researchers determined that the rhyolitic dome material remained mobile. In an interview with Earthweek released on 15 November 2013, Hugh Tuffen of Lancaster University explained that, "the lava was still oozing after almost a year, and it advances between 1 and 3 meters a day." Fieldwork yielded results later published in 2013 that highlighted the heterogeneity of processes (brittle and ductile) that could have existed in order to allow rhyolitic magma to travel explosively and effusively to the surface. This investigation included video documentation of explosive phases of the eruption in 2012 (figure 11). Figure 11. This series of images includes: (a) a location map for Puyehue-Cordón Caulle; (b) a NASA ALI image taken on 26 January 2012 including annotated locations of observation points (red star) and the red box corresponds to the area in "c"; (c) the overlapping vent structures and ash plumes were captured in this GeoEye-1 image from 3 July 2012; (d) and this panorama of the active lava flow observed on 10 January 2012 (note that the scale is approximate). Original images are from Schipper and others, 2013. References. Earthweek: A diary of the planet, 15 Nov. 2013, http://www.earthweek.com/2013/ew131115/ew131115d.html. Schipper, C.I., Castro, J.M., Tuffen, H., James, M.R., and How, P., 2013. Shallow vent architecture during hybrid explosive-effusive activity at Cordón Caulle (Chile, 2011-12): Evidence from direct observations and pyroclast textures, Journal of Volcanology and Geothermal Research, 262: 25-37. Information Contacts: Observatorio Volcanológico de Los Andes del Sur-Servicio Nacional de Geología y Minería (OVDAS-SERNAGEOMIN), Avda Sta María No. 0104, Santiago, Chile (URL: http://www.sernageomin.cl/); Daniel Lindsey, NOAA/NESDIS/STAR/RAMM Branch (URL: http://rammb.cira.colostate.edu/); René Servranckx, Meteorological Service of Canada (URL: http://www.ec.gc.ca/meteo-weather/default.asp?lang=En&n=FDF98F96-1); and Montreal Volcanic Ash Advisory Centre (VAAC) (URL: http://ec.gc.ca/meteo-weather/default.asp?lang=En&n=6B59FE0C-1). Based on analyses of satellite images, the Buenos Aires VAAC reported that on 16 January steam-and-gas emissions with minor amounts of ash rose from the Cordón Caulle rift zone, part of the Puyehue-Cordón Caulle volcanic complex, to an altitude of 2.4 km (8,000 ft) a.s.l. The plume quickly dissipated. The Alert Level remained at Green (lowest on a four-color scale). A scientist from NOAA's National Environmental Satellite, Data, and Information Service (NESDIS) reported that an ash cloud drifting NNE from the Cordón Caulle rift zone, part of the Puyehue-Cordón Caulle volcanic complex, was visible in satellite images starting at 0800 on 14 December. The scientist noted that, although it appeared to be a fresh emission, the cloud was likely re-suspended ash from strong southerly winds. In addition, no other evidence of renewed activity was detected. OVDAS-SERNAGEOMIN reported that, although cloud cover often prevented observations during 17-22 April, satellite and web camera views of the Cordón Caulle rift zone, part of the Puyehue-Cordón Caulle volcanic complex, occasionally showed plumes that rose no higher than 400 m above the crater. Incandescence from the crater was observed during 17-18 and 20-21 April. Due to the low level of activity and decreasing seismicity, the Alert Level was lowered to Yellow on 23 April. OVDAS-SERNAGEOMIN reported that, although cloud cover often prevented observations during 11-17 April, satellite and web camera views of the Cordón Caulle rift zone, part of the Puyehue-Cordón Caulle volcanic complex, showed plumes almost daily that rose no higher than 1 km above the crater. Incandescence from the crater was observed during 10-11 April. The Alert Level remained at Orange. OVDAS-SERNAGEOMIN reported that during 9-10 April satellite and web camera observations of the Cordón Caulle rift zone, part of the Puyehue-Cordón Caulle volcanic complex, showed plumes that rose no higher than 450 m above the crater. Incandescence from the crater was also observed. The Alert Level remained at Orange. OVDAS-SERNAGEOMIN reported that during 27 March-3 April satellite and web camera observations of the Cordón Caulle rift zone, part of the Puyehue-Cordón Caulle volcanic complex, showed plumes that rose no higher than 1.2 km above the crater. Incandescence from the crater was observed every night. The Alert Level remained at Orange. OVDAS-SERNAGEOMIN reported that although cloud cover often prevented satellite and web camera observations of the Cordón Caulle rift zone, part of the Puyehue-Cordón Caulle volcanic complex, during 20-27 March plumes were sometimes observed rising no higher than 1 km above the crater. The Alert Level was lowered to Orange on 23 March. Incandescence from the crater was observed during 23-27 March. Based on seismicity detected during 13-20 March, OVDAS-SERNAGEOMIN reported that the eruption from the Cordón Caulle rift zone, part of the Puyehue-Cordón Caulle volcanic complex, continued at a low level. Plumes observed during 13-16 March in web camera and satellite images rose 0.4-1.2 km above the crater, and drifted 30 km E on 14 March, 20 km N on 15 March, and 17 km NNE on 19 March. Incandescence from the crater was observed during 13-14 and 16-20 March. The Alert Level remained at Red. Based on seismicity detected during 6-13 March, OVDAS-SERNAGEOMIN reported that the eruption from the Cordón Caulle rift zone, part of the Puyehue-Cordón Caulle volcanic complex, continued at a low level. Plumes observed most days in web camera and satellite images rose 0.3-1.2 km above the crater and drifted 30-50 km NNE, E, and SW. Incandescence from the crater was observed during 5-8 and 10-13 March. The Alert Level remained at Red. Based on seismicity detected during 28 February-4 March, OVDAS-SERNAGEOMIN reported that the eruption from the Cordón Caulle rift zone, part of the Puyehue-Cordón Caulle volcanic complex, continued at a low level. During 28-29 February plumes observed with a web camera and satellite images rose 1 km above the crater and drifted 40 km NNE. During 2-3 March plumes rose 0.7-3 km above the crater and drifted SE. Cloud cover prevented observations of the crater on 4 March. The Alert Level remained at Red. Based on seismicity detected during 21-27 February, OVDAS-SERNAGEOMIN reported that the eruption from the Cordón Caulle rift zone, part of the Puyehue-Cordón Caulle volcanic complex, continued at a low level. SERNAGEOMIN and ONEMI scientists aboard an overflight on 21 February reported that lava reached the valley of the Nilahue River, and two lava flows advanced to the N margin of the W crater. Some areas were covered in pumice and gray ash deposits. During 23-24 February plumes observed with a web camera rose 1 km above the crater; clouds prevented views on 22 and 25-26 February. Satellite images showed ash plumes drifting 60-100 km N and E during 22-23 February. Clouds prevented clear satellite views during 24-26 February. Crater incandescence was observed on 26 February. The Alert Level remained at Red. Based on seismicity detected during 15-21 February, OVDAS-SERNAGEOMIN reported that the eruption from the Cordón Caulle rift zone, part of the Puyehue-Cordón Caulle volcanic complex, continued at a low level. During 14-16 and 20-21 February plumes observed with a web camera rose 1 km above the crater; clouds prevented views during 17-19 February. Satellite images showed ash plumes drifting 12-180 km NE, ENE, SE, and ESE during 14-15 and 18-21 February. Clouds prevented views from satellite during 16-17 February. Crater incandescence was observed during 14-15 February. The Alert Level remained at Red. Based on seismicity detected during 8-13 February, OVDAS-SERNAGEOMIN reported that the eruption from the Cordón Caulle rift zone, part of the Puyehue-Cordón Caulle volcanic complex, continued at a low level. During 8-11and 13 February plumes observed with a web camera rose 1-3 km above the crater; clouds prevented views on 12 February. Satellite images showed ash plumes drifting 20-90 km N, NE, ENE, E, ESE, and SSE during 8-13 February. The Alert Level remained at Red. Based on seismicity detected during 1-7 February OVDAS-SERNAGEOMIN reported that the eruption from the Cordón Caulle rift zone, part of the Puyehue-Cordón Caulle volcanic complex, continued at a low level. During 1-7 February plumes observed with a web camera rose 1-4 km above the crater and satellite images showed ash plumes drifting 90-180 km NE, ENE, E, and SE. On 2 February a plume drifted 32 km NE and then dispersed 100 km N. The Alert Level remained at Red. Based on seismicity detected during 25-31 January OVDAS-SERNAGEOMIN reported that the eruption from the Cordón Caulle rift zone, part of the Puyehue-Cordón Caulle volcanic complex, continued at a low level. During 25-28 January plumes observed with a web camera rose 2-4 km above the crater and satellite images showed ash plumes drifting 90-320 km S and SE. During 29-31 January clouds prevented views. The Alert Level remained at Red. Based on seismicity detected during 18-24 January OVDAS-SERNAGEOMIN reported that the eruption from the Cordón Caulle rift zone, part of the Puyehue-Cordón Caulle volcanic complex, continued at a low level. On 18, 20, and 22-23 January plumes observed with a web camera rose 2.5-7 km above the crater and on 18, 20, and 22-24 January satellite images showed ash plumes drifting 25-110 km NE, E, SE, and W. The Alert Level remained at Red. Based on seismicity during 11-16 January OVDAS-SERNAGEOMIN reported that the eruption from the Cordón Caulle rift zone, part of the Puyehue-Cordón Caulle volcanic complex, continued at a low level. Plumes observed with a web camera during the week rose 1-4 km above the crater, and satellite images showed ash plumes drifting 60-300 km N, NE, and SE. The Alert Level remained at Red. According to a news article, an airport cancelled all flights in and out of Bariloche, Patagonia, on 16 January because of ash plumes. An airport in Melbourne, Australia, was also forced to close due to ash from these eruptions. Based on seismicity during 6-8 January OVDAS-SERNAGEOMIN reported that the eruption from the Cordón Caulle rift zone, part of the Puyehue-Cordón Caulle volcanic complex, continued at a low level. Plumes observed with a web camera rose 2 km above the crater on 6 January. Satellite images showed ash plumes drifting 50 km S on 6 January and 300-450 km SE during 8-9 January. Clouds prevented views on the other days. The Alert Level remained at Red. Based on seismicity during 28 December-3 January, OVDAS-SERNAGEOMIN reported that the eruption from the Cordón Caulle rift zone, part of the Puyehue-Cordón Caulle volcanic complex, continued at a low level. Small incandescent explosions were observed at night during 28 December-3 January. Plumes observed with a web camera during the week rose 1-5 km above the crater. Satellite images showed ash plumes drifting 20-80 km N, NNE, NE, and SE during 28 December-3 January, dispersing ash to distances of 100-260 km. On 28 December ash fell as far away Argentina, up to 580 km SE. The Alert Level remained at Red. Based on seismicity during 21-26 December, OVDAS-SERNAGEOMIN reported that the eruption from the Cordón Caulle rift zone, part of the Puyehue-Cordón Caulle volcanic complex, continued at a low level. Small incandescent explosions were observed at night during 21-24 December. Plumes observed with a web camera during 22-23 December rose 1-2.5 km above the crater and 5 km above the crater on 26 December. Satellite images showed ash plumes drifting 20-250 km E, SE, SW, NW, and NNE during 21-26 December. Ash spread 140 km NW and 200 km NNW on 23 December, ash scattered 55 km SE on 25 December, and 100 km N and 200 km ESE on 26 December. The Alert Level remained at Red. Based on seismicity during 14-20 December, OVDAS-SERNAGEOMIN reported that the eruption from the Cordón Caulle rift zone, part of the Puyehue-Cordón Caulle volcanic complex, continued at a low level. Plumes observed with the web camera during 14-15 December rose 2.4-2.5 km above the crater and plumes were identified in satellite imagery drifting 30-50 km SE, S, and NE during 14-18. Satellite images showed ash plumes drifting 40-270 km SE, S, and NE during 14-18 December. The Alert Level remained at Red. Based on seismicity during 7-13 December, OVDAS-SERNAGEOMIN reported that the eruption from the Cordón Caulle rift zone, part of the Puyehue-Cordón Caulle volcanic complex, continued at a low level. Plumes observed with the web camera during 8-9 December rose 3.0-3.5 km above the crater and plumes were identified in satellite imagery drifting 90 km SE on 8 December and 250 km ENE on 9 December. Cloud cover prevented web camera and satellite observations during 10-13 December, but ashfall was reported to the E during 10-11 December. The Alert Level remained at Red. Based on seismicity during 30 November-6 December, OVDAS-SERNAGEOMIN reported that the eruption from the Cordón Caulle rift zone, part of the Puyehue-Cordón Caulle volcanic complex, continued at a low level. During 1-3 and 5 December plumes observed with the web camera rose 1.5-3 km above the crater. On 1 December satellite imagery showed an ash plume drifting 90 km SSE with sparse ashfall to the W and NW and dissipated 100 km to the SE. During the night the crater was incandescent. Satellite imagery showed an ash plume drifting E and SE and reaching the Atlantic Ocean on 2 December. Cloud cover prevented satellite data during 3-4 December. On 5 December satellite imagery showed a plume drifting 100 km NW. The Alert Level remained at Red. Based on seismicity during 23-28 November, OVDAS-SERNAGEOMIN reported that the eruption from the Cordón Caulle rift zone, part of the Puyehue-Cordón Caulle volcanic complex, continued at a low level. Cloud cover prevented web camera views during 24-25 November, but satellite imagery showed a discontinuous ash plume drifting E and reaching the Atlantic Ocean on 24 November, and a fan-shaped ash plume spreading NE to SE on 25 November. Plumes observed with the web camera during 26-27 November rose 2.3-2.5 km above the crater. According to a news article, flights out of Uruguay were disrupted or cancelled on 26 November due to ash plumes. A plume observed in satellite imagery drifted 300 km E on 28 November. The Alert Level remained at Red. Based on seismicity during 16-20 November, OVDAS-SERNAGEOMIN reported that the eruption from the Cordón Caulle rift zone, part of the Puyehue-Cordón Caulle volcanic complex, continued at a low level. Cloud cover prevented web camera views on 16 November, but satellite imagery showed an ash plume drifting 100 km SW and sparse ashfall to the E. During 18-20 November plumes observed with the web camera rose 2.5-3 km above the crater. Satellite imagery showed ash clouds drifting E and SE on 18 November and an ash plume drifting 250 km SE on 19 November. During the night on 20 November the crater was incandescent. Cloud cover prevented observations on 21 November. The Alert Level remained at Red. According to a news article, flights in Uruguay and Argentina were disrupted or cancelled on 22 November due to the presence of ash. Based on seismicity during 9-13 November, OVDAS-SERNAGEOMIN reported that the eruption from the Cordón Caulle rift zone, part of the Puyehue-Cordón Caulle volcanic complex, continued at a low level. During 9-10 November clouds prevented observations with an area web camera, but on 9 November satellite imagery showed an ash plume that drifted and dissipated to the E. During 11-12 November mostly gray plumes observed with the web camera rose 4-7 km above the crater. During the night the crater was incandescent and small explosions were observed. Satellite imagery showed ash plumes drifting 90 km NE on 11 November and 400 km SE on 12 November. Ash fell in areas on the border of Chile and Argentina at Paso Samore on 12 November. Cloud cover prevented web camera views on 13 November, but satellite imagery showed a plume drifting 250 km NE. A gray plume rose 6.5 km above the crater on 14 November. That same day a plume identified in satellite imagery drifted 200 km NW and ash clouds drifted from the SE to the NE. The Alert Level remained at Red. Based on seismicity during 3-8 November, OVDAS-SERNAGEOMIN reported that the eruption from the Cordón Caulle rift zone, part of the Puyehue-Cordón Caulle volcanic complex, continued at a low level. During 3-6 November plumes observed with an area web camera rose 5 km above the crater, and satellite imagery showed active plumes drifting 30-120 km N, NE, E, and SE. Ash plumes dispersed as far as 300 km NE and SE. Area cameras showed a plume rising 2 km above the crater on 7 November. Cloud cover prevented observations of the plume with the area camera the next day and from satellite during 7-8 November. The Alert Level remained at Red. Based on seismicity during 26 October-1 November, OVDAS-SERNAGEOMIN reported that the eruption from the Cordón Caulle rift zone, part of the Puyehue-Cordón Caulle volcanic complex, continued at a low level. During 26-29 October white plumes observed with an area web camera rose 4.5-5 km above the crater. Satellite imagery showed a plume drifting 30 km SW and W on 26 October, and diffuse ash plumes drifting E during 27-28 October. Small incandescent explosions were observed at night during 28-29 October. A plume observed in satellite imagery drifted 180 km N and NW on 29 October, and ashfall was reported in Lonquimay. On 30 October seismicity possibly indicated minor lava effusion. A mostly white plume rose 7.5 km above the crater and ash plumes observed in satellite imagery drifted 350 km NW and N. Ashfall was reported in Río Bueno (80 km WNW). Small incandescent explosions were observed at night during 30-31 October. A mostly white plume rose as high as 6.5 km above the crater on 31 October and ash plumes observed in satellite imagery drifted 270 km S and SSW. On 1 November satellite imagery showed an ash plume that drifted 300 km SE. The Alert Level remained at Red. Based on seismicity during 19-25 October, OVDAS-SERNAGEOMIN reported that the eruption from the Cordón Caulle rift zone, part of the Puyehue-Cordón Caulle volcanic complex, mostly continued at a low level. Seismicity did increase during the last few days of the reporting period. Plumes visible with an area web camera rose no higher than 2 km above the crater during 19-20 October. A small plume visible in satellite imagery on 19 October drifted 50 km E and a diffuse ash plume drifted 150 km NE and SE. On 20 October a small plume drifted 70 km E.
At night on 22 October incandescence emanated from the crater, possibly from active lava flows reported during the previous few days. At 0311 an explosion generated a plume that rose 4.5 km above the crater as well as increased incandescence from the crater. An ash plume observed in satellite imagery drifted 120 km W and NW, and a diffuse ash plume drifted 250 km NE and SE. During the day a white plume rose 3 km above the crater. Satellite imagery showed a plume that drifted 125 km NE, then dissipated NE and SE. On 24 October, a plume rose 6 km above the crater. Satellite imagery showed a plume drifting 125 km NE and a diffuse ash plume drifting 280 km in the same direction. The next day white plumes did not rise higher than 7.5 km above the crater and satellite imagery showed a plume that drifted 100 km NW and SW. The Alert Level remained at Red. Based on seismicity during 11-12 October, OVDAS-SERNAGEOMIN reported that the eruption from the Cordón Caulle rift zone, part of the Puyehue-Cordón Caulle volcanic complex, continued at a low level. Plumes visible with an area web camera rose no higher than 4 km above the crater during 11-12 October. On 17 October a white plume rose 4.5 km above the crater and a diffuse ash plume observed in satellite imagery drifted 30 km SE. The next day, a white plume rose 3 km above the crater. Satellite imagery showed a plume drifting 50 km NE, and then later a diffuse ash plume drifting 200 km NE and SE. The Alert Level remained at Red. According to news articles, several domestic and international flights in Argentina, Brazil, Chile and Uruguay were cancelled on 16 October due to re-suspended ash. OVDAS-SERNAGEOMIN also noted that there was not an increase in volcanic activity, but high winds in the region. Flights resumed the next day. Based on seismicity during 5-10 October, OVDAS-SERNAGEOMIN reported that the eruption from the Cordón Caulle rift zone, part of the Puyehue-Cordón Caulle volcanic complex, continued at a low level. Plumes visible with an area web camera rose no higher than 4 km above the crater during 5-7 October and were observed in satellite imagery drifting 30-60 km SE, SW, and N. On 9 October a white plume observed with the camera rose 4 km above the crater. Satellite imagery that day showed a widely dispersed ash plume drifting E. On 10 October a plume that was mostly white, but occasionally gray, rose 3.5 km above the crater. The Alert Level remained at Red. Based on seismicity during 28 September-4 October, OVDAS-SERNAGEOMIN reported that the eruption from the Cordón Caulle rift zone, part of the Puyehue-Cordón Caulle volcanic complex, continued at a low level. Plumes visible in satellite images drifted 30-300 km NW, NE, E, and SE during 28 September-3 October. Plumes were also observed with an area camera to rise as high as 4 km during 30 September-4 October. The Alert Level remained at Red. Based on seismicity during 21-26 September, OVDAS-SERNAGEOMIN reported that the eruption from the Cordón Caulle rift zone, part of the Puyehue-Cordón Caulle volcanic complex, continued at a low level. Plumes observed by an area camera rose 3-5 km above the crater during 21-23 and 25 September and were visible in satellite images drifted 30-300 km NE, E, and SE during 21-26 September. The Alert Level remained at Red. 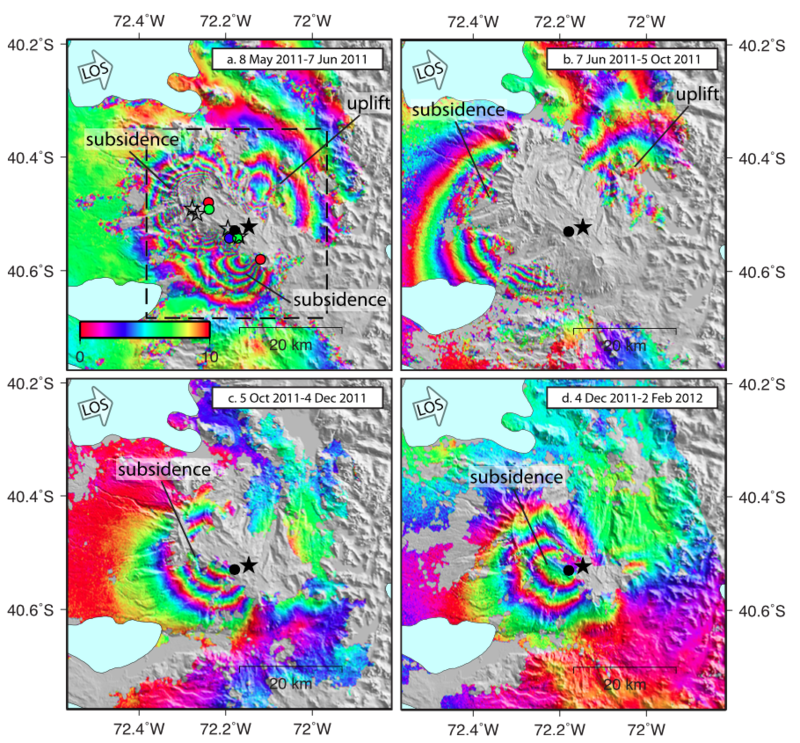 Based on seismicity during 14-16 and 18-20 September, OVDAS-SERNAGEOMIN reported that the eruption from the Cordón Caulle rift zone, part of the Puyehue-Cordón Caulle volcanic complex, continued at a low level. Although cloudy weather mostly prevented observations of the vent, a plume was observed in satellite imagery drifting 60 km E on 14 September, and the next day, a plume observed by an area camera rose 4 km above the crater and drifted SE. Plumes observed in satellite imagery drifted 40-70 km N and NW during 18-20 September. Plumes observed during 19-20 September by an area camera rose 3-4 km above the crater. According to a news article, on 17 September the first commercial plane landed at the airport in Bariloche, about 60 km SE, since the airport had closed on 4 June. Private planes had been occasionally using the airport since mid-July. The Alert Level remained at Red. Based on seismicity during 31 August-5 September, OVDAS-SERNAGEOMIN reported that the eruption from the Cordón Caulle rift zone, part of the Puyehue-Cordón Caulle volcanic complex, continued at a low level. Although cloudy weather mostly prevented satellite and camera observations of the vent, plumes detected in satellite imagery during 31 August-1 September drifted SE and SW. A plume observed by an area camera on 1 September rose 1 km above the crater. On 3 and 5 September plumes observed in satellite imagery drifted 30-80 km SE and E. The Alert Level remained at Red. Based on seismicity during 24-25 August, OVDAS-SERNAGEOMIN reported that the eruption from the Cordón Caulle rift zone, part of the Puyehue-Cordón Caulle volcanic complex, continued at a low level. A predominantly white plume observed by an area camera rose 1 km above the crater. The seismic network detected four explosions that caused the plume to turn gray. Ashfall was reported in Temuco. The Alert Level remained at Red. During 16-23 August, OVDAS-SERNAGEOMIN reported that seismic activity indicated the eruption from the Cordón Caulle rift zone, part of the Puyehue-Cordón Caulle volcanic complex, continued at a low level. Cloudy weather mostly prevented satellite and camera observations of the eruption during 16-17 August, however a mostly white plume was observed by an area camera rising 2 km above the crater on 16 August. A plume that was sometimes gray rose 2.5 km above the crater on 18 August. A plume observed in satellite imagery that same day drifted 200 km NW. A period of harmonic tremor that lasted about 25 minutes may have indicated lava emission. Incandescence was observed at night during 18-19 August. On 19 August a camera recorded a mostly white plume that rose 2 km above the crater. Satellite imagery showed a plume drifting 270 km NW. During an overflight, conducted by ONEMI in collaboration with the Air Force, scientists observed a white plume rising 1.4 km that was dark gray for the first few meters above the vent. Solidified lava filled up a depression around Cordón Caulle; no active lava flows were noted. On 20 August a plume that was mostly white rose 2.5 km above the crater. Two explosive events caused the plume to rise 4 km and contain a higher concentration of ash. Satellite imagery showed a plume drifting 200 km WNW on 20 August, and 500 km SE and NW on 21 August. A white plume that rose 2 km above the crater was observed on 22 August. Satellite imagery showed a very diffuse plume drifting E. The Alert Level remained at Red. During 10-14 August, OVDAS-SERNAGEOMIN reported that the eruption continued from the Cordón Caulle rift zone, part of the Puyehue-Cordón Caulle volcanic complex. Cloud cover prevented video camera observations during 10-12 August and satellite observations during 10-11 August. A diffuse plume detected in satellite imagery on 12 August drifted 150 km E. On 14 August a gray plume recorded by the camera rose 2 km above the crater, and satellite imagery showed a plume drifting 100-150 km E and SE. The Alert Level remained at Red, indicating that ashfall and lahars remain a hazard. During 3-8 August, OVDAS-SERNAGEOMIN reported that the eruption continued from the Cordón Caulle rift zone, part of the Puyehue-Cordón Caulle volcanic complex. During 3-4 August a video camera recorded plumes rising 2 km above the crater. Satellite imagery showed plumes drifting 1,000 km NE on 3 August and 700 km SE on 4 August. Cloud cover prevented video camera and satellite observations on 5 August. The next day cloud cover again prevented camera observations, though satellite imagery detected a plume that drifted 250 km E then SE. Plumes that were mostly white rose no higher than 2.5 km above the crater during 7-8 August. Satellite imagery on 7 August detected plumes that drifted 100-200 km SE. The Alert Level remained at Red. During 25 July-1 August, OVDAS-SERNAGEOMIN reported that the eruption from the Cordón Caulle rift zone, part of the Puyehue-Cordón Caulle volcanic complex, continued and seismicity indicated that the lava flow remained active. Cloud cover prevented observations by a video camera on 25 July, though satellite imagery detected a plume that drifted 200 km SE. On 26 July the camera recorded a plume that rose 2 km above the crater and incandescence up to 500 m above the crater was observed at night. Satellite imagery showed a plume drifting 100 km SE. Cloud cover again prevented camera observations during 27-28 July, but on 28 July a 150-km-long plume was observed in satellite imagery drifting SE. During 29-31 July plumes rose 2-5 km above the crater and satellite imagery showed plumes drifting 80-400 km SW, N, and NE. Incandescence was observed up to 300 m above the crater at night during 29-30 July. Cloud cover prevented observations on 1 August. The Alert Level remained at Red. OVDAS-SERNAGEOMIN reported that on 20 July cameras installed around the Puyehue-Cordón Caulle volcanic complex recorded gray ash plumes that rose 3 km above the Cordón Caulle rift zone. Satellite imagery showed that the plume drifted 80 km E, becoming diffuse. Incandescence up to 500 m above the crater was observed at night. During 20-21 July seismic signals indicated active lava flows. Cloudy weather on 21 July prevented crater observations. Eruption plumes observed in satellite imagery on 22 July drifted 250 km E and SE. Seismic data indicated that the lava flows had stopped. The next day plumes rose 1-2 km above the crater; satellite imagery detected plumes that drifted 100 km E and SE. On 25 July gray ash plumes rose as high as 2.5 km and drifted SE. Lava flows were again active based on seismic data. The Alert Level remained at Red. OVDAS-SERNAGEOMIN reported that on 12 and 14 July cameras installed around the Puyehue-Cordón Caulle volcanic complex recorded eruption plumes that rose no higher than 2 km above the Cordón Caulle rift zone and drifted E; weather prevented observations of the plume on 13 July. Seismic activity declined significantly. On 15 July satellite imagery showed a plume drifting 80 km E and seismic signals indicated that lava started to flow again. The effusion rate increased on 16 July, however weather again prevented observations. A light gray plume on 17 July rose 2 km above the crater and was observed in satellite imagery drifting 240 km E. According to a news article, the first plane landed at the airport in Bariloche, about 100 km E, since the airport had closed on 4 June. On 18 July a gray plume rose 5 km above the crater and drifted 150 km NW. Incandescent material observed at night was ejected 500 m above the crater and lava flows continued to be active. The Alert Level remained at Red. OVDAS-SERNAGEOMIN reported that during 6-8 July cameras installed around the Puyehue-Cordón Caulle volcanic complex recorded eruption plumes that rose no higher than 2 km above the Cordón Caulle rift zone and drifted N and NE. On 6 July satellite imagery indicated that the plume drifted 75 km NE. During 7-8 July explosions recorded by the seismic network corresponded to increases in the plume height and, on 7 July, caused windows in Riñinahue to vibrate. According to news articles, numerous flights in and around Argentina and Uruguay were cancelled on 8 July and some airports had remained closed. On 9 July seismicity indicated that lava flows had ceased. During 9-11 July weather conditions prevented views of the eruption plume by cameras installed around the volcano. Based on analysis of satellite imagery, the Buenos Aires VAAC stated on 9 July that, although ash plumes rose to an altitude of 3 km (10,000 ft), activity was weakening. Ash was again detected by satellite during periods of clear weather the next day. The Alert Level remained at Red. OVDAS-SERNAGEOMIN reported that the eruption continued from the Cordón Caulle rift zone, part of the Puyehue-Cordón Caulle volcanic complex. During 29-30 June weather conditions prevented views of the eruption plume by cameras installed around the volcano as well as by satellite. On 1 July a white plume, possibly with lower ash content, rose 3 km above the crater and was observed in satellite imagery drifting 200 km N. News articles noted that flights in Argentina were disrupted. During 2-4 July SERNAGEOMIN noted that dark gray plumes rose 2-4 km above the crater and were detected in satellite imagery drifting 200-900 km NW, N, and somewhat E. Although there were no new aerial observations, seismicity indicated that during 29 June-2 July the lava flow remained active, although to a lesser degree than during previous days. During 2-3 July seismic signals indicated that lava had stopped flowing or was emitted at a slower rate. The next day high-intensity tremor suggested that the lava flow was again active. On 5 July satellite imagery showed that the plume drifted N then NW. The Alert Level remained at 6, Red. OVDAS-SERNAGEOMIN reported that the eruption continued from the Cordón Caulle rift zone, part of the Puyehue-Cordón Caulle volcanic complex. During 22 and 24-26 June cameras installed around the volcano recorded ash plumes that rose 2-4 km above the crater and drifted NW, N, and NE. Although meteorological cloud cover prevented camera observations on 23 and 28 June, the Buenos Aires VAAC reported that ash clouds detected in satellite imagery rose to altitudes of 4-4.6 km (13,000-15,000 ft) a.s.l. and drifted E and NE. On 25 June SERNAGEOMIN noted that satellite images showed that the plume drifted 200 km N then an additional 900 km NNE. The next day the plume drifted 250 km N, then turned NNW and drifted 1,450 km. According to news articles, numerous flights in and around Argentina and Chile were cancelled, as well as some flights in Uruguay. On 27 June satellite images detected a plume that was dense for 300 m then was no longer discernable due to meteorological clouds. News outlets noted that flights in New Zealand had resumed. Ashfall was periodically reported in areas downwind, including in Riñinahue (5-10 mm of ash) Llifen, Futrono, and Curarrehue on 22 June, and Riñinahue, Pucón, and Melipeuco (in the region of Araucanía) on 25 June. Although there were no new aerial observations during 22-27 June, pulses of high-intensity tremor indicated that the lava flow remained active. The Alert Level remained at 6, Red. OVDAS-SERNAGEOMIN reported that the eruption from the Cordón Caulle rift zone, part of the Puyehue-Cordón Caulle volcanic complex, that began on 4 June continued during 15-18 June. The seismic network detected small explosions on 15 June. The eruption plume rose 4-5 km above the crater and drifted SE. The base of the plume was dark gray and ash continued to fall in areas near the volcano. The next day the plume rose 3 km above the crater and was whiter. Satellite imagery showed the plume drifting 1,400 km ESE. On 17 June the plume rose 2 km above the crater and drifted SE. About 5 mm of ash had accumulated in Pajaritos during the night. Ashfall was also reported in eastern areas of Lago Rupanco, about 30 km SSW. According to news articles, plumes from the eruption had circumnavigated the globe, arrived in the W part of Chile (in Coyhaique, 550 km S of the volcano), and again caused domestic flights to be canceled. On 19 June SERNAGEOMIN noted that meteorological weather prevented clear observations, although a thermal camera used during an overflight showed a thermal anomaly near the emission center. The plume rose 2 km above the crater and drifted SE. A news article stated that authorities lifted the evacuation ban for area residents, allowing them to return home. Articles also stated that flights in South Africa were disrupted during 18-19 June. SERNAGEOMIN personnel along with regional authorities flew over Puyehue-Cordón Caulle on 20 June. They observed a viscous lava flow with concentric morphology, confirming speculation of magma ascent reflected in seismic data from the previous few days. A 50-m-wide lava flow from the emissions center had traveled 200 m NW and 100 m NE, filling up a depression. A white plume that was gray at the base rose 3-4 km above the crater. Devastated vegetation from pyroclastic flows was observed near the basin of the Nilahue and Abutment rivers. Pulses of tremor were detected by the seismic network. Cameras installed around the volcano showed the plume, which was periodically very dark, rising 5-6 km above the crater. On 21 June the plume rose 3-4 km above the crater and was dark at the base. Although there were no new aerial observations, the seismic signals indicated that the lava flow remained active. News reports noted that flights were again disrupted in parts of Australia on 21 June. SERNAGEOMIN reiterated that the Alert Level remained at 6, Red. OVDAS-SERNAGEOMIN reported that the eruption from the Cordón Caulle rift zone, part of the Puyehue-Cordón Caulle volcanic complex, that began on 4 June continued on 5 June. At least five pyroclastic flows were generated from partial collapses of the eruptive column and traveled N in the Nilahue River drainage. The pyroclastic flows were possibly 10 km long. On 6 June the continuous ash plume changed direction and was blown ENE as far as 178 km while the previous portion of the plume continued to drift ESE over the ocean. On 7 June the Buenos Aires VAAC reported that ash plumes rose to altitudes of 5.5-9.8 km (18,000-32,000 ft) a.s.l. and were 65-95 km wide. OVDAS-SERNAGEOMIN reported that on 8 June satellite imagery showed a 1,200-km-long eruption plume drifting NE, then SE over the Atlantic Ocean. Personnel working in the area reported that the ash plume rose 7.5 km above the crater. On 9 June climatologic conditions prevented ground-based observations of the plume, however satellite imagery showed a 200-km-long plume drifting NE. Pumice and vitreous tephra had accumulated in many area lakes and rivers, and ash had turned many rivers darker. Despite poor visibility due to meteorological conditions on 10 June, the plume was observed to have risen 3.7 km above the crater and drifted SE. News articles stated that flight disruptions continued in Argentina and Uruguay, and flights from airports in Brazil had been cancelled. On 11 June the plume was whiter than previous days and rose to heights 4-4.5 km above the crater and drifted 350 km E. A dispersed plume was detected as far as 600 km ENE. Some flights resumed in affected parts of Chile, Argentina, and Uruguay. An overflight on 11 June revealed that the vent was located at the head of the Nilahue River's basin, immediately to the N of the 1960 eruption fissure location. Abundant amounts of ash had accumulated around the vent as well as to the E and SW. Ash plumes rose 4-4.5 km above the crater; an explosion that day caused an ash plume to rise 8 km above the crater. On 12 June seismicity was relatively stable except for four hybrid earthquakes and a pulse of tremor that lasted about 2 hours and 40 minutes. A series of explosions (up to 8 events per minute) were also registered. Very dense, dark gray ash plumes rose 8 km above the crater. Satellite imagery showed a distinct eruption plume drifting 300 km E, with a diffuse plume reaching 1,000 km ENE. According to news articles, the ash plume that had been drifting mostly E since the beginning of the eruption had reached Australia and beyond, causing flight cancellations in southern Australia and New Zealand. Scientists aboard an overflight on 13 June observed the plume height oscillating and noted that the eruptive vent diameter was 300-400 m. Gas-and-steam plumes rose from two or three locations along the same fissure as the eruptive vent. Pulses of tremor were associated with dark gray ash plumes that rose 9 km above the crater. Ashfall and column collapses were noted. At night incandescence from the base of the plume reached 1.5-2 km high. Satellite imagery showed the plume drifting 250 km SE. On 14 June explosions generated pyroclastic flows (that traveled N), with associated ash-and-gas plumes. Based on analysis of satellite imagery, the VAAC stated that ash plumes rose to altitudes of 5.5-7.6 km (18,000-25,000 ft) a.s.l. while previously emitted ash plumes drifted NE, E, and SE at altitudes of 0.9-3 km (3,000-10,000 ft) a.s.l. SERNAGEOMIN reiterated that the Alert Level remained at 6, Red. OVDAS-SERNAGEOMIN reported that between 2000 on 2 June and 1959 on 3 June about 1,450 earthquakes at Puyehue-Cordón Caulle were detected, or an average of about 60 earthquakes per hour. The earthquakes were mostly hybrid and long-period, and located in the SE sector of the Cordón Caulle rift zone at depths of 2-5 km. SERNAGEOMIN scientists along with regional authorities flew over the volcano, noting no significant changes. The Alert Level remained at 4, Yellow. Area residents reported feeling earthquakes during the evening of 3 June through the morning of 4 June. For a six-hour period on 4 June, seismicity increased to an average of 230 earthquakes per hour, at depths of 1-4 km. About 12 events were magnitudes greater than 4, and 50 events were magnitudes greater than 3. The Alert Level was raised to 5, Red. ONEMI reported that the border crossing into Argentina was closed and about 700 local people were to start evacuating. Later, an explosion from Cordón Caulle produced a 5-km-wide ash-and-gas plume that rose to an altitude of 12.2 km (40,000 ft) a.s.l. as noted by OVDAS scientists. The plume drifted S at 5 km altitude, and W and E at 10 km altitude. The Alert Level was raised to 6, Red. ONEMI reported the continuation of evacuations and increased the potential number of evacuees to 3,000. ONEMI also reported that the National Director of SERNAGEOMIN noted that lava was not detected, but pyroclastic flow deposits were observed. Residents reported a strong sulfur odor and significant ash and pumice fall. During 4-5 June ashfall several centimeters thick was reported in San Carlos de Bariloche, 100 km SE in Argentina, and surrounding areas. Based on analyses of satellite imagery, SIGMET notices, and information from the Puerto Montt Flight Information Region (FIR), the Buenos Aires VAAC reported that on 4 June ash plumes rose to altitudes of 10.7-13.7 km (35,000-45,000 ft) a.s.l. and drifted 870 km ESE. Diffuse gas-and-steam plumes drifted W. The next day an ash plume continued to rise to altitudes of 10.7-12.2 km (35,000-40,000 ft) a.s.l. and had drifted as far as 1,778 km ESE, over the coast of Argentina, and out into the Atlantic Ocean. A portion of the plume drifted WSW. News outlets reported that flights in southern Argentina were canceled during 4-5 June. On 6 June the continuous ash plume changed direction and was blown ENE as far as 178 km while the previous portion of the plume continued to drift ESE over the ocean. On 7 June the VAAC reported continuous emissions. Ash plumes rose to altitudes of 5.5-9.8 km (18,000-32,000 ft) a.s.l. and were 65-95 km wide. A large area of ash continued to drift E over the Atlantic Ocean. News articles noted that some flights in Paraguay and Chile were cancelled and about 4,000 people had evacuated. News photos showed ashfall and people collecting pumice in San Martin de los Andes, Argentina, 80 km NE. ODVAS-SERNAGEOMIN reported that on 26 April an overflight was conducted in response to recent increased seismicity and nearby residents noting fumarolic activity in the vicinity of Puyehue-Cordón Caulle. Scientists did not observe anything unusual that would indicate increased activity at Puyehue or Cordón Caulle, just typical fumarolic activity. On 27 April a seismic swarm was detected at depths of 4-6 km; a majority of the events were hybrid earthquakes and the largest was M 3.9. Seismicity decreased but was continuing through 29 April. The Alert Level was raised to 3, Yellow. "Clouds of black smoke and columns of ashes began to pour forth 1 March from the Puyehue volcano in Chile which resumed activity after several years. The volcano is located a few kilometers west of San Carlos de Bariloche, Argentina." "On Friday, march 3rd, a message was received at 9:00 a.m. from the Emergency Office of the Ministry of the Interior asking about the possible start of activity of the Puyehue volcano. Despite information indicating total calm in the area, it was thought worthwhile, both by the Volcanological Group and the Emergency Office, to carry out an aerial reconnaissance of the volcano as soon as possible. The Emergency Office obtained a flight for 15:00 hours from the Chilean Air Force. At 16:10 hours a twin-engined Bonanza, piloted by Captain de la Cuadra, took off with volcanologists Fco. Munizaga and O. Gonzalez on board from the El Bosque airport in Santiago. "After 2 hours 20 min. in the air it flew over, at 18:30 hours, the main crater of Puyehue which was covered with snow and showed no signs of an eruption and the same was true of the NE fracture from the eruption of 1960 [Cordón Caulle]. Both this crater and the center of Carran-Nilahue showed no sign of recent eruption. There was good visibility in the centers indicated. To the E of the Argentine frontier region there was partial cloud which made observations of the bordering Argentine territory impossible. The return journey was begun, with a stop at Temuco and landing at Santiago at 23:00 hours on the same day. "Conclusion: The Puyehue volcano and adjacent areas to the north, south, and west show no signs of eruption up to this date. Santiago, March 4th, 1972." Information Contacts: Card 1362 (02 March 1972)Chilean news media; Oscar Gonzalez-Ferran, Universidad de Chile. Card 1371 (28 March 1972)Oscar Gonzalez-Ferran, Universidad de Chile. Cordón Caulle began generating a series of small to moderate felt earthquakes and discontinuous subterranean noises during the final week of May. The Univ of Chile and the Univ of the Frontera monitored the activity with two seismometers on 28 and 29 May. They detected harmonic tremor and small earthquakes centered N of Puyehue, generally located on Cordón Caulle. Santiago radio reported that four tremors were felt in the area over a 12-hour period on the night of 29 May. The tremors shook with Mercalli-scale intensity IV and V.
The radio report said that the activity had also drawn a team of professionals from the Geosciences Institute of Valdivia Austral Univ to the area. Meanwhile, the police, army officers, civil authorities, and scientists had formed an emergency action committee and established a "White Alert," which signifies the detection of possibly abnormal volcanic activity and mandates that emergency plans be reviewed and updated. Information Contacts: N. Banks, US Embassy, Santiago. Until 4 June 2011, the volcanic complex named Puyehue-Cordón Caulle had been quiet since its last major eruption in 1960. This report summarizes an increase in seismicity in early 2011 and the ensuing eruption that began on 4 June 2011. Our previous and only reports on the complex were in March and April 1972, which offered and then dismissed a report of a 1972 eruption (CSLP Cards 1362 and 1371). Information here goes through 2011 but omits some remote sensing observations. The eruption continued through at least April 2012, but in March and again in April 2012 the eruption's diminished vigor resulted in successively lowered alert statuses. 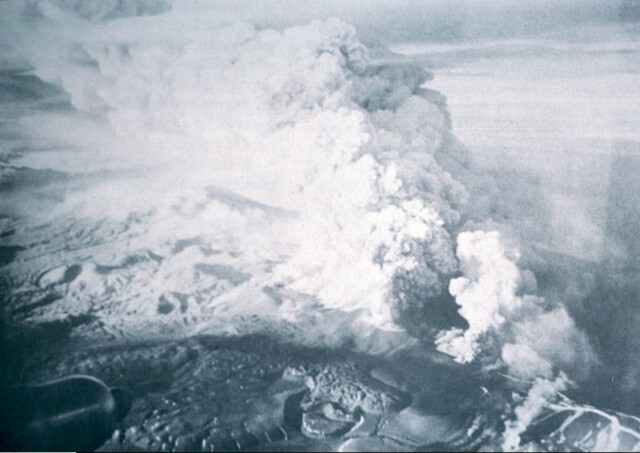 During the height of the eruption the vent emitted ash plumes and generated significant ashfall, and flights were cancelled as far away as Australia and New Zealand. Pyroclastic flows occurred, with runout distances up to 10 km. The Puyehue-Cordón Caulle complex includes Puyehue volcano at the SE end and the Cordillera Nevada caldera at the NW end. The current eruption discussed here vented at a location roughly between these two features, along the same fissure complex that had been active in the 1960 eruption. Available information failed to disclose any other eruptive sites during the reporting interval. Although the eruption continues as this report goes to press in March 2012, the report discusses activity only during 2011. A subsequent report will discuss further details, including satellite data on eruptive plumes, and updates since the end of the 2011 reporting period. This report also contains a table that condenses reporting from the Buenos Aires Volcanic Ash Advisory Center (VAAC). Precursory seismicity. The Southern Andes Volcanological Observatory-National Geology and Mining Service (SERNAGEOMIN) reported that on 26 April 2011 an overflight of the volcano was conducted in response to recent increased seismicity and observations of fumarolic activity by nearby residents. Scientists confirmed fumarolic activity, but did not observe any other unusual activity. On 27 April a seismic swarm (with about 140 events under ML 3.0) was detected at depths of 4-6 km below the complex. Most were hybrid earthquakes, the largest being M 3.9. Lower levels of seismicity continued through 29 April. That day the Alert Level was raised to Yellow (on a scale from Green to Yellow to Red). According to SERNAGEOMIN, between 2000 on 2 June and 1959 on 3 June 2011, about 1,450 earthquakes occurred at Puyehue-Cordón Caulle (~60 earthquakes/hour, on average). More than 130 earthquakes occurred with magnitudes greater than 2.0. The earthquakes were mostly hybrid and long-period, and located in the SE sector of the Cordón Caulle rift zone at depths of 2-5 km. A flight over the volcano revelaed no significant changes. Area residents reported feeling earthquakes during the evening of 3 June through the morning of 4 June. For a six-hour period on 4 June, seismicity increased to an average of 230 earthquakes/hour, with hypocenter depths of 1-4 km. About 12 events were of magnitudes greater than 4.0, and 50 events were of magnitudes greater than 3.0. As a result of the increased seismicity, the Alert Level was raised from Yellow to Red on 4 June. Eruption. On 4 June 2011, an explosion from Cordón Caulle produced a set of plumes, including an ash plume described as 5 km wide and with its top at ~12 km altitude. Portions of the plume bifurcated; at ~5 km altitude a part of the plume drifted S, and at ~10 km altitude parts drifted W and E. A news account (Agency France-Presse) around this time, quoting a government official, said the eruption would lead to the evacuation of 4,270 residents. According to the Oficina Nacional de Emergencia-Ministerio del Interior (ONEMI), SERNAGEOMIN had noted the presence of pyroclastic flow deposits, but not lava. Residents reported a strong sulfur odor and significant ash and pumice fall. According to the BBC, the number of evacuees rose to 3,500-4,000 during the next several days. According to SERNAGEOMIN, the eruption from the Cordón Caulle rift zone, although somewhat diminished, continued on 5 June. At least five pyroclastic flows were generated from partial collapses of the eruptive column and traveled N in the Nilahue River drainage. These pyroclastic flows extended up to 10 km from the vent. Figures 1-3 show scenes of the volcano from various perspectives, including a natural color January 2012 image from space. Figure 1. Puyehue-Cordón Caulle's eruption seen in a long-exposure photo taken during 4-6 June 2011. The photo depicts molten material discharging over a wide area near the eruption column's base. Above the glowing, molten material there grew a substantial, rapidly rising ash plume. Much of the scene is lit by numerous bolts of lightning. Courtesy of Daniel Basualto, European Pressphoto Agency. Figure 2. A long-exposure photograph of the eruption at the Puyehue-Cordón Caulle complex taken on 5 June 2011. The complex scene shows a wide eruption column aglow with prominent lightning strikes branching across its surface. The long exposure is evidenced by the long star trails (with stars forming streaks due to the Earth's rotation) and the superimposition of many distinct bolts of lightning. Courtesy of Franscisco Negroni, Agencia Uno/European Pressphoto Agency. Figure 3. Satellite photo acquired on 26 January 2012 of the Puyehue-Cordón Caulle area. The natural color image was taken by the Advanced Land Imager aboard the Earth Observing (EO-1) satellite. The emissions, which blow in a narrow band toward the SE, can clearly be observed emanating from the Cordón Caulle fissure complex and not from the Puyehue volcano itself. According to a NASA Earth Observatory report, after 8 months of ceaseless activity, the landscape around the Puyehue-Cordón Caulle complex was covered in ash. The light-colored ash appears most clearly on the rocky, alpine slopes surrounding the active vent and the Puyehue caldera. Within the caldera, the ash appears slightly darker, possibly because it may be resting on wet snow that is melting and ponding during the South American summer. NASA also noted that evergreen forests on the E side of the volcano complex have been damaged by months of nearly continuous ashfall, and are now an unhealthy brown, while forests to the W had only received intermittent coatings of ash and appeared relatively healthy. Courtesy of NASA (Robert Simmon, Mike Carlowicz, and Jesse Allen). Eruptive plumes were dense, oftentimes continuous, and extended E over Argentina and then the Atlantic Ocean (table 1). Ashfall reached up to about 15 cm thick in Argentina and adjacent parts of Chile (figures 4-6). Numerous flights were cancelled as far away as Australia and New Zealand, and many airports were forced to close temporarily (see section below). Table 1. The Puyehue-Cordón Caulle ash plume altitudes and drift distances and directions documented by aviation authorities between 4 June 2011 and 3 January 2012. A plume on any particular date may be a continuation of a plume on the previous day(s). All maximum plume heights are stated in altitudes (a.s.l.). '-' indicates data not reported. Cloud cover often prevented video camera and satellite observations. Data from the Buenos Aires Volcanic Ash Advisory Center (VAAC) and SERNAGEOMIN. 04 Jun 10.7-13.7 870 km ESE 5-km-wide ash-and-gas plume. 05 Jun 10.7-12.2 1,778 km ESE Plume drifted over Atlantic Ocean toward Australia. 07 Jun 5.5-9.8 E Continuous emission, plume 65-95 km wide; large ash cloud drifted E over Atlantic Ocean. 08 Jun 10 1,200 km NE, SE Plume moved over Atlantic Ocean. 09 Jun -- 200 km ENE Cloud cover obscured view. 10 Jun 6 SE Cloud cover obscured view. 11 Jun 6-10 350 km E, 600 km ENE Explosion caused plume to rise to 10 km a.s.l. 12 Jun 10 300 km E, 1,000 km ENE Series of explosions, tremor lasted 2 hr, 20 min; 4 hybrid earthquakes. 13 Jun 11 250 km SE Incandescence, tremor. 14 Jun 5.5-7.6 -- Explosions generated pyroclastic flows. 15 Jun-21 Jun 4-8 1,400 km ESE Small explosions on 15 June, ashfall heavy, pulses of tremor. 22 Jun-28 Jun 4-6 1,450 km NNW, 200-900 km various Active lava flow. 29 Jun-05 Jul 4-6 200-900 km NW, N, E Active lava flow. 06 Jul-12 Jul 3-4 75 km NE Explosions on 7-8 Jul caused windows to vibrate in Riñinahue. 13 Jul-19 Jul 4-7 80-240 km E, 150 km NW Incandescence on 18 July. Active lava flow. 20 Jul-26 Jul 3-5 100-250 km E, SE, 80 km E Incandescence on 20 Jul. Active lava flow. 27 Jul-02 Aug 4-7 100-200 km SE, 80-400 km various Incandescence on 26 and 29-30 Jul. Active lava flow. 10 Aug-16 Aug 4 100-150 km E, SE Mostly white plumes. 17 Aug-23 Aug 4-6 200-270 km NW, 500 km NW, SE Two explosions, harmonic tremor for 25 minutes; incandescence on 18-19 Aug.
24 Aug-30 Aug 3 -- Four explosions; ashfall in Temuco. 19 Oct-25 Oct 4-10 50-250 km various Explosion and incandescence on 22 Oct; lava flows reported on previous days. 26 Oct-01 Nov 7-10 30-350 km various Small incandescent explosions on 28-31 Oct.
09 Nov-15 Nov 6-9 90-250 km NE, 200 km NW, 400 km SE Small explosions and incandescence; ashfall on Chile/Argentine border. 16 Nov-22 Nov 5-6 250 km SE, 100 km SW Incandescence on 20 Nov.
23 Nov-29 Nov 5-6 -- Ash plume reached Atlantic Ocean. 30 Nov-06 Dec 4-5 90-100 km various Incandescence. 07 Dec-13 Dec 5-6 90 km SE, 250 km ENE Ashfall to E.
21 Dec-27 Dec 3-7 20-250 km various Small incandescent explosions. 28 Dec-03 Jan 2012 3-7 20-260 km various Small incandescent explosions; ash fell up to 580 km SE, in Argentina. Figure 4. Photograph published on 6 June 2011 of workers using earth-moving equipment to remove the ash that fell 100 km SE of the Puyehue-Cordón Caulle in San Carlos de Bariloche, Argentina. As discussed in a subsection below, the ash led to the cancellation of numerous public activities, and flights were suspended. Courtesy of Alfredo Leiva, Associated Press. Figure 5. Photograph of an Air Austral jet stranded at the airport at San Carlos de Beriloche, Argentina, on 7 June 2011 after being covered with ash that blew over the Andes from the Puyehue-Cordón Caulle complex. Courtesy of Alfredo Leiva, Associated Press. Figure 6. A member of the media walks along a road covered with ash from the Puyehue-Cordón Caulle complex that crossed Cardenal Samoré pass, a major linkage along the border between Argentina and Chile. Courtesy of Ivan Alvarado, Reuters. According to news accounts (BBC, MailOnline, Merco Press), the Nilahue river, which runs off the N slopes of the volcano, became clogged with ash and overflowed its banks. The press reports said that the river water was steaming, having been locally heated up to 45°C by hot volcanic material, and more than four million salmon and other fish died. During 4-5 June, ashfall several centimeters thick was reported in San Carlos de Bariloche, Argentina (about 100 km SE of the volcano) and in surrounding areas (figures 4-6). ONEMI reported that the Cardenal Samoré mountain pass border crossing between Argentina and Chile had temporarily closed on 4 June due to poor visibility caused by the heavy ashfall. According to a press report (EMOL), the road crossing the border was covered with ash that locally reached 10-15 cm thick. According to MailOnline and Boston.com, ash covered Lake Nahuel Huapi, Argentina's largest lake, which lies in the eastern foothills of the Andes. Videos documenting the eruption are abundant on the YouTube website (a search there using "Puyehue volcano" brings up over 400 hits. See several examples in the Reference list below). By 9 June 2011, pumice and vitreous tephra had accumulated in many area lakes and rivers, darkening the color or their waters (figure 7). Figure 7. Photo of ash-clogged Nilahue River (Chile) with steam hanging above the river. Courtesy of Reuters. A government observation flight on 11 June revealed that the vent was located at the head of the Nilahue River's basin, a spot immediately N of the 1960 eruption fissure. Observers found that abundant amounts of ash had accumulated around the vent, as well as to the E and SW.
Scientists aboard an observation flight on 13 June reported that the eruption formed a cone located in the center of a crater ~300 to ~400 m in diameter. Gas-and-steam plumes rose from two or three locations along the same fissure as the eruptive vent. Scientists watching a strong ash emission saw the lower part of the ash column collapse. Dark gray ash plumes that rose to an altitude of ~11 km. Instrumental records around that time registered pulses of tremor. At other points on 13 June, plume heights oscillated. On 20 June, a news article (Agency France-Presse) reported that authorities had ended the evacuation, enabling residents to return home. SERNAGEOMIN personnel along with regional authorities flew over the Puyehue-Cordón Caulle complex on 20 June. They observed a viscous lava flow, confirming speculation of magma ascent based on seismic data from the previous few days. A 50-m-wide lava flow had traveled 200 m NW and 100 m NE from the point of emission, filling a depression. A white plume with a gray base rose 3-4 km above the crater. Devastated vegetation from pyroclastic flows was observed near the Nilahue and Abutment rivers. Pulses of tremor were detected by the seismic network. Plumes continued through at least the end of 2011. Although there were no new aerial observations, the seismic signals indicated that the lava flow remained active. Ashfall was periodically reported in areas downwind, including on 22 June in Riñinahue (5-10 mm of ash), Llifen, Futrono, and Curarrehue, and on 25 June in Riñinahue, Pucón, and Melipeuco (in the region of Araucanía). Decline in seismicity. By the end of June, seismic activity had decreased further. During July through at least 31 December 2011, the eruption continued at a low level. Numerous plumes (mostly white, but sometimes containing ash) were noted during this period, often rising as high as 2.5 km above the crater (4.7 km altitude) and occasionally higher. Cloudy weather often prevented satellite and camera observations. Some of the ash plumes dropped ash in nearby communities, and some ash plumes extended for hundreds of kilometers, continuing to disrupt air traffic. Occasional incandescence and lava flows were noted. During 18-19 August 2011, a period of harmonic tremor lasted about 25 minutes and may have indicated lava emission. Incandescence was observed at night. An observation flight on 19 August showed that solidified lava had filled up a depression around the cliffs of the Cordón Caulle area; no active lava flows were noted. On 30 October 2011 seismicity indicated a possible minor lava effusion. Ashfall was reported in Río Bueno (80 km WNW). During the night of 11-12 November 2011, crater incandescence and small explosions were observed. Satellite imagery showed ash plumes drifting 90 km NE on 11 November and 400 km SE on 12 November. Ash fell in areas on the border of Chile and Argentina, and at Paso Samore on 12 November. As of 31 December 2011, the Alert Level remained at Red. Disruption of airline traffic. Based upon a review of news accounts on the Internet, the massive ash plumes resulting from the eruption caused major delays and cancellations of air traffic worldwide. Between 4-14 June, numerous flights were cancelled or disrupted in Paraguay, Chile, southern Argentina, Uruguay, and Brazil. News accounts (Reuters, CBS News, Global Media Post) reported that the two major airports serving Buenos Aires, Argentina, and the international airport in Montevideo, Uruguay, closed for several days as did many airports in southern Argentina, including those in Patagonia. One of the worst hit airports serves the ski resort city of San Carlos de Bariloche, Argentina. On 9 June alone, workers removed about 15,000 tons of volcanic ash (600 truckloads) from the airport's main runway. According to news accounts (Sydney Morning Herald, Agency France-Presse, Stuff, Australian Associated Press), by the middle of June, the ash plume that had been drifting mostly E since the beginning of the eruption had reached Australia and New Zealand. This caused flight disruptions and airport closures in Australia. By the third week in June, according to the Associated Press, plumes from the eruption had circumnavigated the globe, arrived in the W part of Chile (in Coyhaique, 550 km S of the volcano), and again caused the cancellation of domestic flights. During the last week of June, numerous flights in and around Argentina and Chile were again cancelled, as well as some flights in Uruguay. According to Stuff, Associated Press, and South Africa To, ash from the second circumnavigation of the ash plume again disrupted flights at Capetown and Port Elizabeth, South Africa, as well as in Australia. During the first two weeks of July, numerous flights in and around Argentina and Uruguay were cancelled and some airports remained closed. According to Merco, the first private plane landed around 17 July at the airport in Bariloche, Argentina, since the airport had closed on 4 June. On 17 September, the first commercial flights resumed at Bariloche. Ash clouds remained a problem for months after the eruption. According to news articles, several domestic and international flights in Argentina, Brazil, Chile and Uruguay were cancelled on 16 October due to re-suspended ash kicked up by high winds in the region. Flights resumed the next day. According to the Agency France-Presse, airborne ash again disrupted or cancelled flights in Uruguay and Argentina on 22 and 26 November. Information Contacts: Southern Andes Volcanological Observatory-National Geology and Mining Service (SERNAGEOMIN), Avda Sta María No. 0104, Santiago, Chile (URL: http://www.sernageomin.cl/); Buenos Aires Volcanic Ash Advisory Center (VAAC), Servicio Meteorológico Nacional-Fuerza Aérea Argentina, 25 de mayo 658, Buenos Aires, Argentina (URL: http://www.smn.gov.ar/vaac/buenosaires/productos.php); Robert Simmon, Mike Carlowicz, and Jesse Allen, NASA Earth Observatory (URL: http://earthobservatory.nasa.gov); Agency France-Presse (URL: http://www.afp.com/afpcom/en/); Associated Press (URL: http://www.ap.org/); Australian Associated Press (AAP) (URL: http://aap.com.au/); BBC News (URL: http://www.bbc.co.uk/); Big Pond News (URL: http://bigpondnews.com); Boston.com (URL: http://www.boston.com); CBS News (URL: https://www.cbsnews.com/); EMOL (URL: http://www.emol.com/); europaPress (URL: http://www.europapress.es); European Pressphoto Agency (URL: http://wn.com/european_pressphoto_agency); Flight Global (URL: http://www.flightglobal.com); Global Media Post (URL: http://www.globalmediapost.com; La Mañana Neuquén (URL: http://www.lmneuquen.com.ar/); Mail Online (URL: http://www.dailymail.com.uk); MercoPress (URL: http://en.mercopress.com); Reuters (URL: http://www.reuters.com); Sky News (URL: news.sky.com); Stuff (URL: http://www.stuff.co.nz); South Africa To (URL: http://www.southafrica.to); Sydney Morning Herald (URL: http://news.smh.com.au/); The Telegraph (URL: http://bigpondnews.com). The Puyehue-Cordón Caulle volcanic complex (PCCVC) is a large NW-SE-trending late-Pleistocene to Holocene basaltic-to-rhyolitic transverse volcanic chain SE of Lago Ranco. The 1799-m-high Pleistocene Cordillera Nevada caldera lies at the NW end, separated from Puyehue stratovolcano at the SE end by the Cordón Caulle fissure complex. The Pleistocene Mencheca volcano with Holocene flank cones lies NE of Puyehue. The basaltic-to-rhyolitic Puyehue volcano is the most geochemically diverse of the PCCVC. The flat-topped, 2236-m-high volcano was constructed above a 5-km-wide caldera and is capped by a 2.4-km-wide Holocene summit caldera. Lava flows and domes of mostly rhyolitic composition are found on the E flank. Historical eruptions originally attributed to Puyehue, including major eruptions in 1921-22 and 1960, are now known to be from the Cordón Caulle rift zone. The Cordón Caulle geothermal area, occupying a 6 x 13 km wide volcano-tectonic depression, is the largest active geothermal area of the southern Andes volcanic zone. Amigo, Alvaro, 2013. (pers. comm.). Servicio Nacional de Geología y Minería, Programa de Riesgo Volcánico, Santiago, Chile. Gerlach D C, Frey F A, Moreno H, Lopez-Escobar L, 1988. Recent volcanism in the Puyehue-Cordon Caulle region, southern Andes, Chile (40.5° S): petrogenesis of evolved lavas. J Petr, 29: 333-382. Lara L E, Lavenu A, Cembrano J, Rodriguez C, 2006. Structural controls of volcanism in transversal chains: resheared faults and neotectonics in the Cordon Caulle-Puyehue area (40.5° S), Southern Andes. J. Volcanol. Geotherm. Res., 158: 70-86. Lara L E, Moreno H, Naranjo J A, Matthews S, Perez de Arce C, 2006. Magmatic evolution of the Puyehue-Cordon Caulle volcanic complex (40° S), Southern Andean Volcanic Zone: from shield to unusual rhyolitic fissure volcanism. J. Volcanol. Geotherm. Res., 157: 343-366. Lara L E, Naranjo J A, Moreno H, 2004. 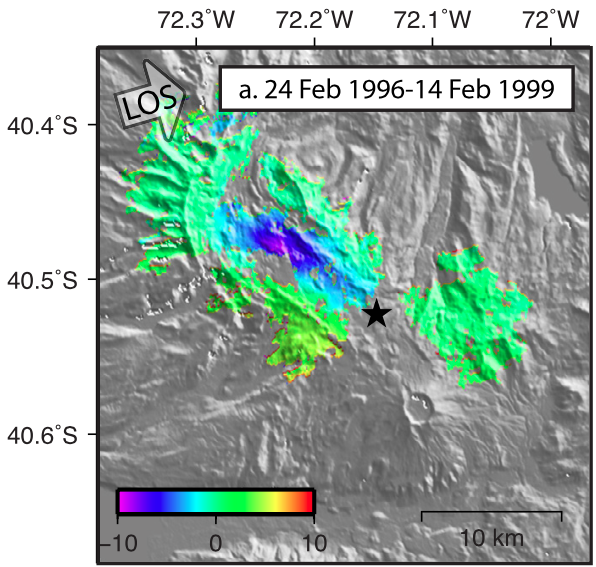 Rhyodacitic fissure eruption in Southern Andes (Cordon Caulle; 40.5° S) after the 1960 (Mw:9.5) Chilean earthquake: a structural interpretation. J. Volcanol. Geotherm. Res., 138: 127-138. Naranjo J, Singer B, Moreno H, Lara L, Jicha B, 2008. Holocene tephrochronology of Puyehue and Casablanca volcanoes, southern Andes. IAVCEI Iceland Gen Assembly, Reykjavik 2008, abs 2-a P12 and poster. Singer B S, Jicha B R, Haper M A, Naranjo J A, Lara L E, Moreno-Roa H, Lara L, 2008. Eruptive history, geochronology, and magmatic evolution of the Puyehue-Cordon Caulle volcanic complex, Chile. Geol Soc Amer Bull, 120: 599-618. 0140 ± 300 years Unknown Confirmed Tephrochronology Puyehue? Remarks: Co-eruptive subsidence associated with the 2011-2012 eruption is interpreted as magma withdrawal from a large, long-lived magma reservoir. From: Jay et al. 2014. Reference List: Jay et al. 2014. 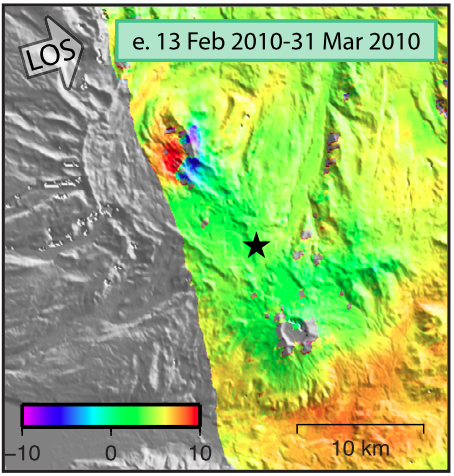 Remarks: A small, localized area of uplift preceded the June 2011 eruption of Cordon Caulle volcano. Individual pre-eruptive interferogram. Line-of-sight (LOS) arrow shows look direction of satellite. Black star indicates location of the 2011?2012 eruptive vent. (i) white circles show locations of earthquakes (OVDAS, 2011) that occurred during the time period of the interferogram; black and red circles shows locations of modeled co-eruptive deflation sources (see Fig. 3 for more detail). 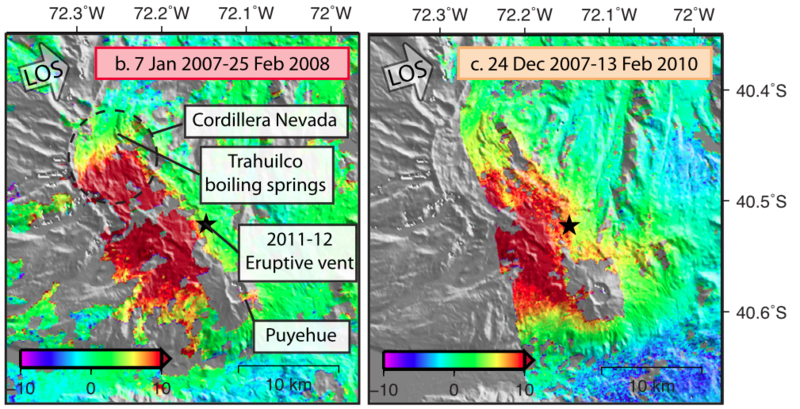 Remarks: A small, localized area of uplift in the Cordillera Nevada caldera of Cordon Caulle volcano was likely triggered by the 2010 Maule earthquake. Individual pre-eruptive interferogram. Line-of-sight (LOS) arrow shows look direction of satellite. Black star indicates location of the 2011?2012 eruptive vent. Reference List: Pritchard et al. 2013; Jay et al. 2014. Remarks: An episode of rapid uplift occurred at Cordon Caulle between 2007 and 2009, ending two years before the 2011-2012 eruption. This uplift is interpreted as an injection of magma into the base of a pre-existing, extensive magma reservoir. Reference List: Fournier et al. 2010; Jay et al. 2014. Remarks: Envisat interferograms between 2003 and 2006 are mostly incoherent but suggest that deformation might have occurred. Envisat interferograms between 2003 and 2006 are mostly incoherent but suggest that deformation might have occurred. From: Fournier et al. 2010. Reference List: Fournier et al. 2010. Reference List: Pritchard and Simons 2004; Jay et al. 2014. Ash-laden eruption plumes rise above a fissure vent at Cordón Caulle volcano on May 24, 1960 during the latest eruption of this volcano. An eruption from the southeast end of the Cordon Caulle fissure system began 48 hrs after a major tectonic earthquake with an epicenter 300 km NW of Puyehue volcano. Tephra fell primarily to the southeast. Lava flows from numerous vents flowed mostly to the southwest. The eruption lasted until the end of June. Photo by Oscar González-Ferrán, 1960 (University of Chile). 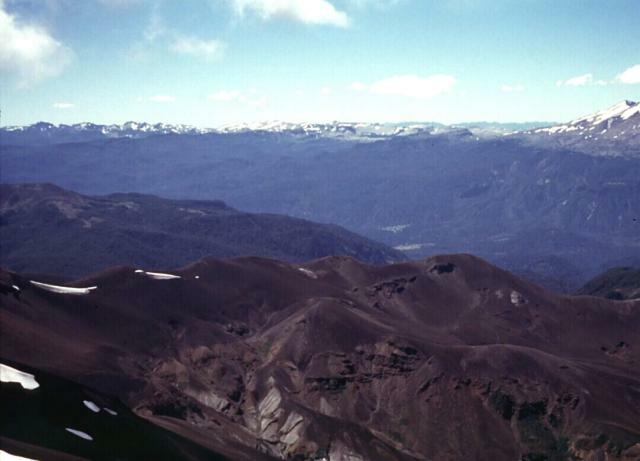 The Puyehue-Cordón Caulle volcanic complex forms the horizon in this view looking north across the Río Gol Gol valley from the Antillanca volcano group. Flat-topped 2236-m-high Puyehue volcano (right) is a late-Pleistocene to Holocene basaltic-to-rhyolitic stratovolcano constructed above a 5-km-wide caldera and capped by a 2.4-km-wide summit caldera. Historical eruptions originally attributed to Puyehue are now known to be from the Cordón Caulle rift zone, the long snow-covered ridge that extends across the photo to the left of Puyehue. Photo by Klaus Dorsch, 2001 (University of Munich). The snow-capped Cordón Caulle volcanic massif rises on the left horizon across the Río Gol Gol valley from the Antillanca volcano group in the foreground. The Cordón Caulle is a group of post-caldera silicic vents formed along a 17-km-long, 2.5-km-wide WNW-ESE rift zone extending to the SE towards Puyehue volcano, whose flanks form the far right horizon. Historical eruptions have occurred from several points along the Cordón Caulle fissure system during the 19th and 20th centuries. 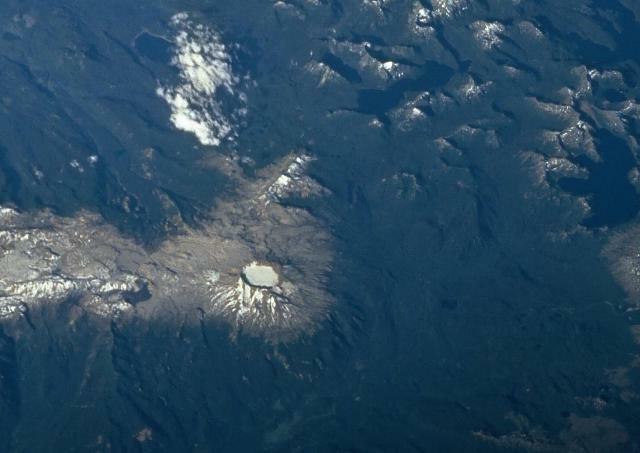 The light-colored area at the left side of this NASA Space Shuttle image (with north to the upper left) is the Puyehue-Cordón Caulle volcanic complex. The elongated Cordón Caulle volcanic chain at the far left merges with the circular, snow-filled caldera of Puyehue volcano. The chain of small snow-covered volcanoes extending diagonally toward the upper right above Puyehue is Mencheca volcano. 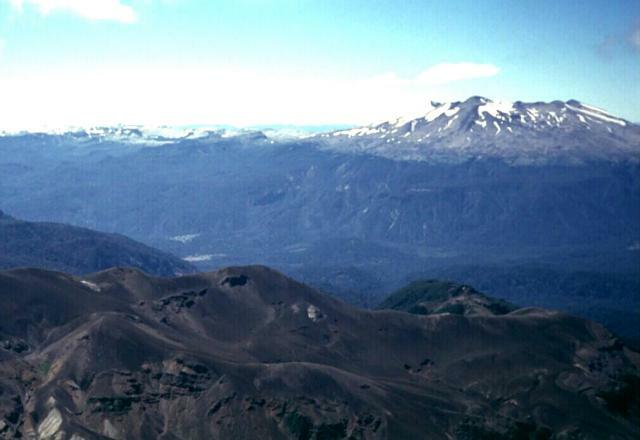 Numerous flank vents, including maars, lava domes, and cinder cones, dot the Puyehue-Cordón Caulle complex. NASA Space Shuttle image STS088-706-14, 1998 (http://eol.jsc.nasa.gov/). Large Eruptions of Puyehue-Cordón Caulle Information about large Quaternary eruptions (VEI >= 4) is cataloged in the Large Magnitude Explosive Volcanic Eruptions (LaMEVE) database of the Volcano Global Risk Identification and Analysis Project (VOGRIPA).